Musician and surfer Jack Johnson may seem laid back, but not when it comes to fighting plastic pollution. Aboard the Mystic Schooner on a research expedition with plastic pollution experts The 5 Gyres Institute, Johnson took a hard jab at The Bag Monster, alter-ego of Andy Keller, founder and president of Chico Bags. Keller, who invented a reusable bag that folds into its own pocket, becomes The Bag Monster when he dons a costume made of 500 plastic shopping bags, the average number of bags used annually by a shopper who accepts plastic shopping bags. Johnson and Keller are both part of the 5 Gyres 2015 SEA (Science, Education, Action) Change Research Expedition which set sail from Miami with stops in Eleuthera, Bahamas and Bermuda before voyaging across the Atlantic to New York City. The explorers aboard the Mystic are trawling the seas to collect and study microplastics, fragments of our plastic civilization that are not contained and have spilled into our environment with significant impacts on sea creatures and our food chain. Johnson lives in Hawaii, the first American state to ban plastic bags. His Johnson Ohana Charitable Foundation supports 5 Gyres, a research, education and policy institution committed to stopping plastic pollution. 5 Gyres is located in California, where Governor Jerry Brown signed a plastic bag ban this year. Citizen Scientists aboard the Mystic Tall Sail Ship with 5 Gyres conduct hourly trawls for microplastics and keep a visual check for larger floating pieces of plastic pollution on the ocean surface. Jack Johnson was shocked at what he saw on his shift. 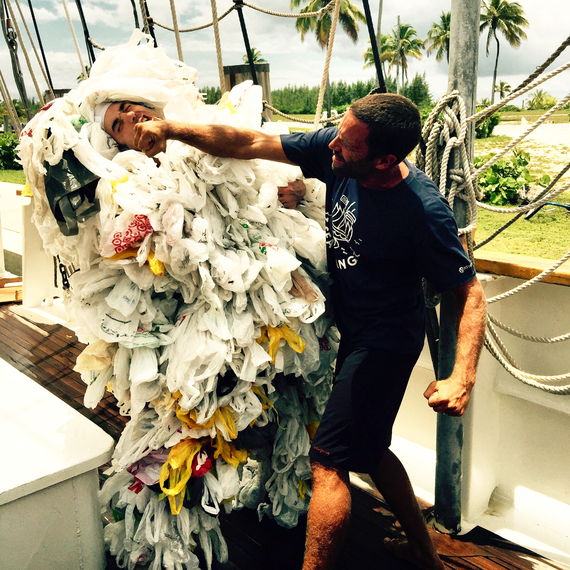 As reported to the students of a local Bahamian school, The Island School, he saw 47 pieces of plastic go by during the first ten minutes of his hour watch, well outside the Atlantic Gyre. Also contributing to the voyage, participating in research, and giving presentations aboard the vessel are Celine Cousteau, Dan and Keith Malloy, champion surfers and filmmakers; Kimi Werner, champion spearfisher and freediver; Mark Cunningham, legendary body boarder and subject of the Malloy brothers' film Come Hell or High Water, which was screened at The Island School to students who participated in a 5 Gyres produced Youth Summit on plastic pollution. Students shared their own research projects including a study of plastic pollution chemical impacts on fish flesh in the Bahamas. 5 Gyres co-founder and research director Marcus Eriksen is the lead author of recent research on the amount of microplastics in world oceans. The amount, more than 5 Trillion Plastic Pieces weighing over 250,000 Tons afloat at sea, is surprising because subtracting the amount of plastic that is recycled, landfilled and burned leaves a huge amount of plastic unaccounted for by the global estimate in our ocean's surface waters. One study estimates the amount of plastic waste lost at sea at 8 million metric tons: the equivalent of "five plastic grocery bags filled with plastic for every foot of coastline in the world." Eriksen hypothesizes that the lost plastic has entered the food chain as it is consumed by marine life and is also settling to the benthos at the bottom of the ocean. 5 Gyres' research shows that 95% of the marine plastics at the surface of the ocean are smaller than a grain of rice, and thus enter the food chain as easily as plankton. The small pieces of plastics have been tested and found to adsorb oily chemicals persistent in the aquatic environment such as petroleum, flame retardants, and even PCBs and DDT that persist even though banned decades ago. The microplastics have been shown to accumulate these toxins in percentages a million times higher than the surrounding waters. The Mystic Schooner is set to dock in New York City on June 23rd. All the participants of the Sea Change Expedition have direct evidence of humankind's impact on the 70 percent of the earth's surface that is ocean. The explorers know for certain now that there is no "away" in our "throw away" culture of single use plastics. Used for brief moments, our disposable plastics persist in our environment indefinitely. But there is great hope as more voters and consumers are educated about plastic pollution through organizations like 5 Gyres, Johnson's own Plastic Free Hawaii program, and other groups such as the Bahamas Plastic Movement and the Plastic Pollution Coalition. Next on the Agenda for 5 Gyres: linking more research to policy solutions as with recent successes banning plastic microbeads in personal care products in numerous states.